Heat oven to 200C/180C fan/gas 6. Butter 5 x 150ml individual soufflé dishes or ramekins and sprinkle all over with 2 tbsp soft brown sugar. Place on a baking sheet. Melt the butter in a saucepan, then add sugar, cream, vanilla and a good pinch salt. When sugar is melted, bubble for 1 min until it looks like a sauce. Pour 200ml into a jug for serving. Stir egg yolks and flour into remaining caramel in the saucepan. Whisk constantly over medium heat until mixture thickens, about 3 mins. Sieve into a bowl and cool for 15 mins. Beat egg whites in large bowl until foamy, then gradually beat in remaining 2 tbsp sugar until whites are stiff but not dry. Fold one-third of whites into caramel mixture in the pan, then fold that back into the whites. Divide among dishes, and use a palette knife to scrape top level. Bake until soufflés are puffed and golden – about 11 mins. The soufflés should still be a little unset in the middle, but not runny, so if you’re serving four, break into your tester to check. Return the rest to oven for 2 mins if underdone. 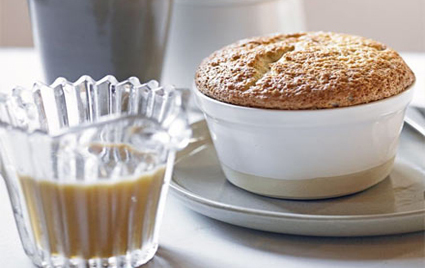 Serve immediately with caramel sauce, warmed a little while soufflés are baking.